Have you tried re-downloading the installer? The installer says there was a problem with the download, which means the download was damaged or incomplete. how? I am doing this through the updater. I am not sure any of the camera raw 6.6 updates are for Photoshop Extended. none of them say they are. I have windows 32-bit XP. this may be a problem too and the cause of why the install failed and the download succeeded. The ACR udpate applies to Extended as well. I have 32-bit XP and I am using extended (master collection), and I don't have a problem. well, actually, I do have a problem with camera raw, sorry for the miswrite. 6.6 workws on XP, it just doesn't update down the wire anymore. I see a camera raw for lightroom and one for photoshop elements. "For Photoshop CS5 and Creative Suite 5 customers, we recommend that you install Camera Raw 6.6 by selecting Updates from the Help menu and follow the on-screen dialogs to download and install the latest available Camera Raw update. You can also click the link below to download an installer that replaces the existing Camera Raw plug-in with Camera Raw 6.6 for all CS5 applications." this is exactly what I have done, and I get the error I mentioned first off. it installed, though the instructions say not to, but to use the updater instead. something somewhere got broken. this is a fairly new installation of master collection. this shouldn't be happening with the updater. something got torqued somewhere, maybe with the last update, i don't know. Yeah. Normally selecting Help>Updates... is easiest and best way to update. It sounds like there was a problem downloading the installer file. Did the automatic way fail right away? Or did it download for a while, then fail during the install phase? If it's the former, it may be a permissions error where the file can't be saved to the location the updater wants to save. the latter. downloaded nearly all the way, then it did something and failed. consistent. I don't think it gets to the install phase. I have plenty of GB of space left. I don't think it's a permissions error. I have not changed the permissions of any of the files on my machine, so whatever happened wasn't my fault except maybe the only thing I have done is move my non-adobe-dated plugins from the adobe program files' plugins dir to a separate directory because I found out that's what you are supposed to do. ps still starts just fine and I see my plugins OK, so I don't think I have mangled anything. I purchased and installed Photoshop CS5.1 some times ago. Today, I've notice that the Camera Raw 6,6 has been release. 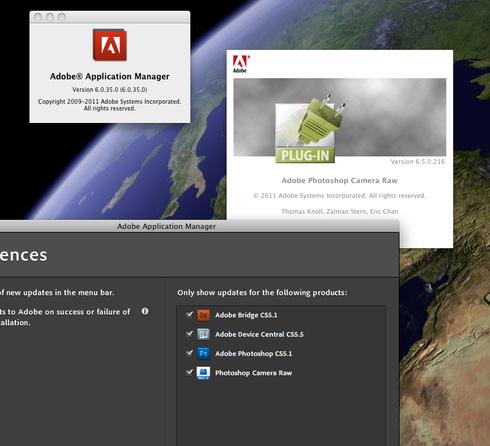 On the Mac ad PC's of my friends, they got the update through "Adobe Application Manager". Unfortunately, on my Mac, the Adobe Application manager does NOT update the Camera Raw. My current Camera Raw revision is "6.5.0.216" and Adobe Application Manager" 6.0.35.0. I Preferences everything is checked "Bridge, Device Central, Photoshop and Camera Raw". I could install the package manually but I really wish to let the updated to to it. PS: MacOS X 10.6.8, Lightroom has been update to 3.6 without problem. Photoshop: Automatic update for Camera Raw 6.6. not working. I've got the same problem- Installation failed. Error Code: U44M2P7 and I've tried both methods of updating ACR. Any other solutions available? My situation is this: I have installed PSE 8 and RAW plug in on my new laptop runing windows 7 x64. I have a Canon T2i shooting RAW. The plug in won't open the RAW pix I have. I am presently traveling and temporarily in Tahiti soon to be in New Zealand. When I try to update the plugin to 6.6 and/or get the DNG converter I get the following page: Attention!!! The file "AdobeCameraRaw-6.6-mul-AdobeUpdate.zip" has been blocked. The file is larger than the configured file size limit. URL = http://download.adobe.com/pub/adobe/p..." I went to adobe chat and the fellow there directed me here, saying he had no ability to address my situation. Please advise. thanks! Error in downloading version 6.6 (or 6.5) RAW plug in. Unable to dl..
Hey guys, I've tried to install via installer and also via dowload, and get the error both ways. I cannot upgrade, please help. Mac OS X 10.7.3. Brand new fully licensed installation of Photoshop CS5.1 Extended. I think if I remember right 6.6 installed with the downloaded file from the site. however, 6.7 came along now and refuses to install too. please TEST if possible before you send this stuff out, adobe, please. I am on xp Pro sp3 32-bit. acr is still not fixed. update error on cr6.7 for cs5 and br4.0.5 update. camera raw 6.7 refuses to install. camera raw 6.7 update fails to install with error U43M1D207. camera raw 6.7 refuses to install. Jeffery Tranberry, I just checked the support advisor on this round of updates and it says it's not updating because of an installed "photoshop cs4". I don't see a photoshop cs4, but I DO see bridge cs4+cs5 and cr 5.7+6.7. how do I completely remove/uninstall the older products but still keep the newer products around? so they would not be "found" by adobe (but I could still put them back if need be). I could be missing something maybe, so I could use somebody's help. I think I am close to a solution, I just don't know how to force the cs5 updater to fire so I can test my progress/work. I don't want to have to wait a week per test to find out whether it works or not. that's too slow. it failed on the update on both bridge 4.0.5 and camera raw 6.7 despite everything I have tried to do. not sure what to do now. help. once again, I have to manually apply updates. I had to wait until the updates were available on the web site. hopefully the rest of the bunch of updates will go through just fine. bridge 4.0.5 and camera raw 6.7 installed just fine manually after doing the steps I outlined above.